The Department of Computer Science (CS) at the University of Houston (UH), in collaboration with the student organization, CougarCS, hosts a career fair each fall and spring. The Computer Science Career Fair is an avenue for current CS students and companies to connect and discuss rewarding opportunities such as internships, co-ops, and full-time positions. Exclusive event open only to UH main campus community (students, alumni, faculty, staff). Up to 40% discounts on select men's and women's career dress apparel and shoes. Schedule an appointment with the STEM Career Counselor, Caitlin Deis, via CougarPathway. Stop by University Career Services during drop-in hours to meet with a career counselor. All currently enrolled UH Computer Science students are encouraged to attend. Meet with any employer anytime between 10am-2pm. Entry doors will close at ~1:30pm to allow companies enougth time to meet with the students remaining students in line. A UH ID is required for entry. Resumes – be sure to bring several copies of your professional resume. Bag Policy - no backpacks will be permitted into the career fair. You will be able to store your bag in a separate room during check-in. The bag room will be monitored by a student volunteer. Dress Code Policy - UH CS and CougarCS require dressing business professional. We adhere to the dress code policy outlined by UH Career Services. Students who fail to follow the dress code policy may be prohibited from entering the career fair until they are in compliance. Take a look at this infograph for reference. A list of resources are available if you are in need of professional dress assistance. Based on past attendance, we expect to connect you with close to 400 Computer Science students. Holding and storage fee: for each package of recruiting materials. Cost varies by the number of packages. Additional table/booth fee: if you would like an additional table/booth, the fee will be half the original registration rate. An additional table/booth is not required for representatives beyond 4, but is recommended to help alleviate congestion. You will receive an acknowledgement email, including invoice, in 2-3 business days. Submit a $500 payment online or via check. Payment instructions will be provided after submitting the registration form. Receipt will be emailed 2-3 business days upon payment. Welcome Center Garage located at the corner of Calhoun Road and University Drive. We will provide a validation ticket during the career fair. Please park only at the Welcome Center Garage as we are unable to validate tickets from other parking garages. Shipping - it is highly recommended to use a company such as FedEx, UPS, etc. as shipping through the US Postal Service will be delayed. Below is the address to ship TO before the fair and the address for PICK UP after the fair. Ship To UH: please arrange your shipment so they arrive any date AFTER Wednesday, February 6. Ship from UH: all companies are responsible for pre-scheduling the pick-up of any materials that need to be shipped back after the fair. Please have your shipping label(s) ready, if applicable. Please send all employer respresentative names to Faith Kelly at fdkelly@central.uh.edu by Thursday, February 7. If you have questions or need additional information regarding the career fair, contact Matthew Pariyothorn at mmpariyo@central.uh.edu. 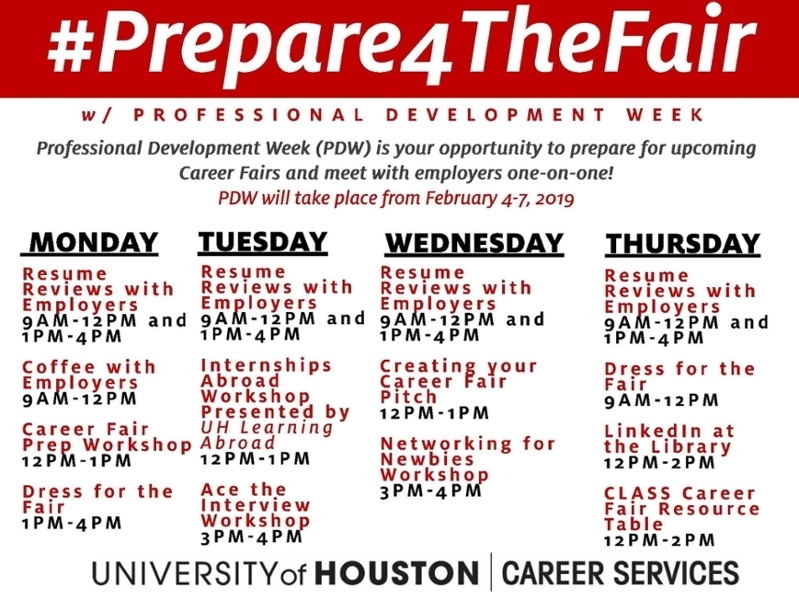 If you are a student needing assistance with preparing for the career fair, utilize the resources on the UH Career Services website or contact the UH STEM Career Counselor, Caitlin Deis, at cdeis@Central.UH.EDU or 713-743-5100.